This is an Atkins design double end cutter with a full keel Ferro Cement Hull built by Wilmington Shipyard with a solid mast. 47' LOA, 14' beam by 40' on glass over marine ply deck, aft cockpit with tiller steering, 100HP Detroit Diesel, Borg Warner transmission, 24 inch three blade prop, mahogany interior, extra sails. marine radio and radar. needs a little bottom work and paint top and bottom, excellent deal my loss is your gain, She runs and sails well, and while she could stand to be hauled, she is ready to go. Double enders sail and handle heavy seas very well. She has a head but no shower. Won't last at this reduced price. 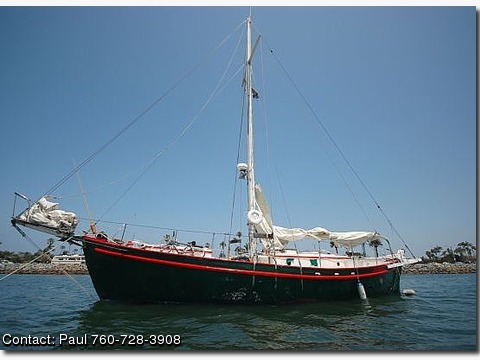 At $12,000 obo she is the Lowest price big sailboat on the net. Load her up and sail away!